While on our Fire Inside Tour we got a chance to talk with and play one of our originals " Freight Train" for WBIR-TV Channel 10. 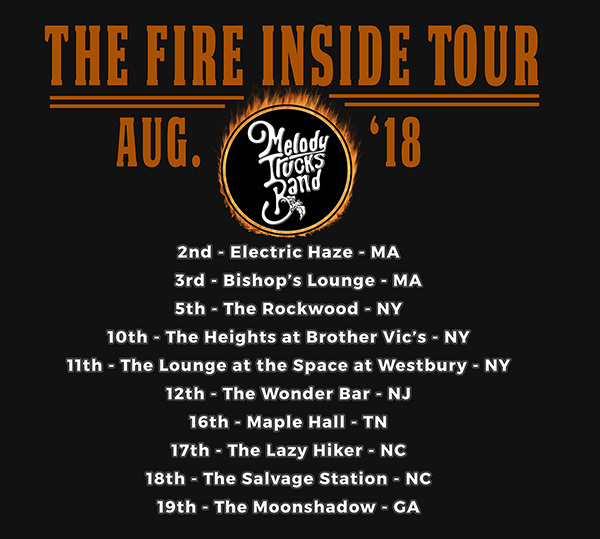 The Melody Trucks Band Heads to the Northeast for the First Time! "So the Northeast is about to discover what we’ve been savoring down South for some time: the deliciousness of the Melody Trucks Band. This is their first venture north, and we predict many new fans in the wake of this brief first tour. It certainly won’t be the last! " Orange Blossom Jamboree, one of the top independent Florida festivals, has announced its 2018 lineup, and it will surely get many Florida music fans over-the-top excited. Early-bird tickets go on sale this Thursday, January 18th. First things first: the 9th annual Orange Blossom Jamboree is being held May 17-20 and will once again be at Sertoma Youth Ranch. For those who have never been, Sertoma is often described as “a mini Spirit of Suwannee Music Park.” It’s heavily wooded with both primitive and electric campsites (though be warned: electric sites usually sell out the same day tickets go on sale) and has much of the same laid-back feel as SoSMP. The nice thing about it being smaller is that about the longest you will have to walk to get from place to place is only a few minutes. The other unique part about OBJ is that it is strictly Florida bands only. It’s a great chance to experience some of the great music we have around the state. Melody Trucks Band recently played Hometeam New Year’s Rally and will also make their Orange Blossom Jamboree debut this year as well. Melody and her band bring a great Southern roots rock and Americana sound that is perfect for festivals. We spoke with the poignant songstress backstage at Wanee, and she gave us some insight into the band’s formation and dynamic chemistry. She also shared some information on some new material the band premiered during a Wanee campfire. We can’t think of a better place and time for the band to make things official! Those who attended the four-day love fest subtitled Hometeam New Year’s Rally won’t tell you that you’re doing it wrong, but they will for darn sure tell you that they’re doin’ it right. Once again, Maddox Ranch in Lakeland hosted 36 sets of music, and from this decidedly non-objective reviewer’s standpoint, every one was at least great if not superb, bordering on best-ever. "On to the highly anticipated set from The Melody Trucks Band, more Jacksonville love. Their very first performance was at Great Outdoors, and this was a triumphant return. This band is so powerful......"
See the FULL WRITE UP on ALL of the bands from Hometeam... including some of our Home Town Jacksonville Favorites! "Then things turned south, as in Jacksonville south, as Bonnie Blue was up. Like Custard Pie, they had only an hour to bring the heat, and they did exactly that. Bradley Churchman and Willis Gore cranked it up on guitars with John Wilson on keyboards in hot pursuit...."
"Speaking of Corbitt, Isaac and brother Newsome were up next and kept the ball rolling with “Mr. Charlie,” “What I Got” and “Ophelia.” I’ve mentioned Corbitt’s numerous sit-ins as artist at large but have failed to state just how great each one was. This man is a master of the harmonica....."
"Jacksonville represent next with the Cat McWilliams Band, a solid rock and blues group. She was a good guitarist and fine vocalist, much reminiscent of Heather Gillis’s singing. She, lead guitarist Toby McWilliams and tenor sax player all soloed on the first tune. Next they offered a really nice interpretation of “Inner City Blues.” Cat belted a superb “Little by Little” before Clay Watson helped out on “Cissy Strut > The Chicken.”....."
Check out Melody's Interview on greenarrowradio.com! Introducing The Melody Trucks Band! Jacksonville, Florida is chock full of talented musicians and this past Thursday at 1904 Music Hall showcased a handful of them. Blackwater Grease opened the night with their consistent high energy chock full of guitar solos and southern rock jams. Somatic followed with West Brook exhibiting his talents on multiple slide (and regular) guitars, alongside masters of the rhythm section, Shane Platten on bass, and Shaun Taunton holding down the drum kit. The much awaited hometown debut of Melody Trucks band was high energy and a total dance party. Tributes to Melody’s late father, Butch Trucks, and appreciation for the music scene we all love incited an emotional experience. The band was made up of a slew of impressive musicians; Melody on conga percussion and lead vocals, West Brook on slide guitar, Shane Platten on bass, Shaun Taunton on the drum kit, and guitarists Willis Gore and Brady Clampit. The Melody Trucks Band is a cohesive piece of expert musicians that represent live jam music in its purest form. They will be performing at Hometeam New Years Rally at Maddox Ranch. Maybe there’s just something in the Florida water. How else do explain another festival where almost every band delivered brilliant if not best-ever performances? Perhaps it was the crowd trading energy back and forth with the musicians. Maybe it was exceptional sound and lighting, again. Possibly it was the amazingly supportive organizational staff, permitting everyone to do what they do best — love live music.